Lillehammer Hostel is located AT the bus and train station in the city centre of Lillehammer. 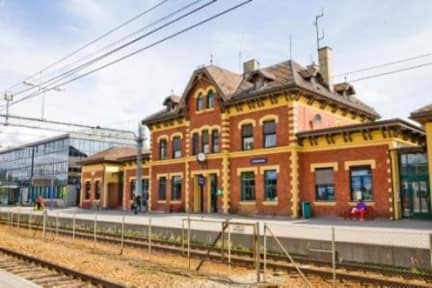 The hostel is actually in the train station building! Guests could not have a better starting point for seeing all that Lillehammer has to offer, including shopping, attractions, restaurants, cafés and hiking. The shopping street in Lillehammer is only 100m walking distance from the hostel. All rooms are equipped with an ensuite, free Wi-Fi and TV. Bed linen and towels are included in the price and beds are made before you arrive. There is a fully equipped guest kitchen, parking (20 NOK for 24 hours / free in the weekend) and cafe. Most of the sights like the open air museum Maihaugen, Lillehammer Art Museum, Sigrid Undset’s home Bjerkebæk, the Olympic Museum and the Olympic Park are within walking distance. There are buses to the family park Hunderfossen and Lilleputthammer. Hafjell Alpine centre is the closest ski centre to the Lillehammer Hostel. Summer holidays; visit the olympic area, the fjords and the mountains. Nature adventures at the mountain. Lillehammer is a relatively small town (albeit with a decent grade of hill to climb up to walk to Mailhaugen) and this hostel is in a perfect location to get to when you first arrive to town. The breakfast buffet is really good (especially because it's included with the rate) and the free coffee at anytime is a real plus. The staff are all friendly and if they didn't know the answer to a question, they were very inclined to find someone who did know the answer and/or how to find it. Nothing's better than stepping off the train and into the hostel! Beautiful historical building, but fully modernized inside. Downstairs cafe is a nice place to relax and plan the day. Pleasant ambiance. Would stay here again definitely. Clean, private accommodation. Greeted by friendly staff. I got into town at 1am and they were able to let me in and show me to my room with no hassle. Breakfast in the café downstairs was amazing and well priced. Rooms were super comfy and sheets were included, which is rare for a lot of places. Overall, great stay here! Very convenient location between the train station and the bus station. Also amazingly quiet (good insulation and lots of snow) and clean. Staff very pleasant and helpful. Buffet breakfast is comprehensive and nutritious. Really liked this place! Staff was incredibly friendly and the rooms were very tidy. The kitchen facilities were also very nice and kept clean. Even though it is right in the train station you don’t hear anything. Could be good to meet people but didn’t have great luck with that myself as the people staying in my room were always just stopping to crash for the night. To expensive for basic hotel. With a great and easily accessible location, the Lillehammer Hostel has an almost Hotel like atmosphere and rooms, where the only difference is the room size and people per room. For the one night that I stayed there, check in was easy, the room quality was good, and the breakfast was great. All for a relatively low price; considering how late I bought the booking. Definitely a good first experience at this hostel. Excellent location just at railway station and bus station. Good breakfast.